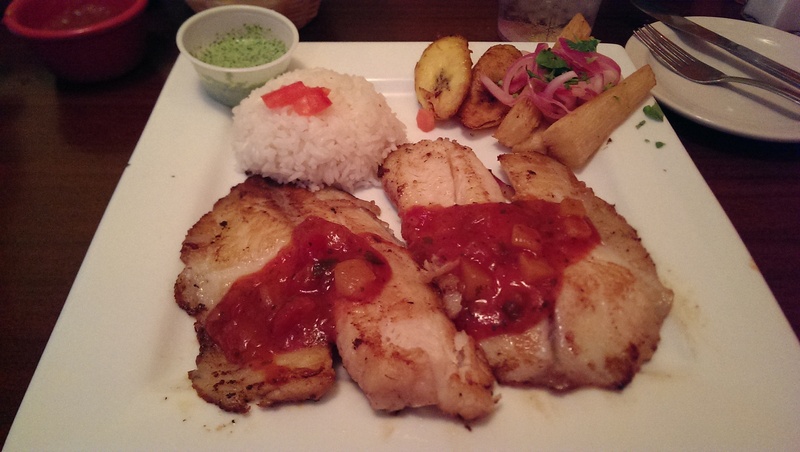 Grilled tilapia covered in sweet mango salsa, with white rice and plantains. Zarate’s has been around since 2007 and is housed in a fun, colorful building on Broadway near the original Route 66. Although it began serving just Tex-Mex food, it quickly morphed into more of a Latin/Caribbean venture. Their menu includes dishes from Peru, Puerto Rico, Brazil, Guatemala, Honduras and, of course, Mexico. I may be missing a few countries in that line up, but suffice it to say that much of South America, Central America and the Caribbean is covered. We each ordered comfort food – chicken for Jon and fish for me. I had the grilled tilapia, and even though it was a sizable portion, I managed to finish the entire plate. Yum. Great way to end the week. The plantains were my favorite part of course. Jon had the Jamaican jerk chicken with white rice and decided to pass on the black beans. He seemed to like it, and especially enjoyed the basket of tortilla chips with salsa that our waiter continuously filled for us throughout our dinner. 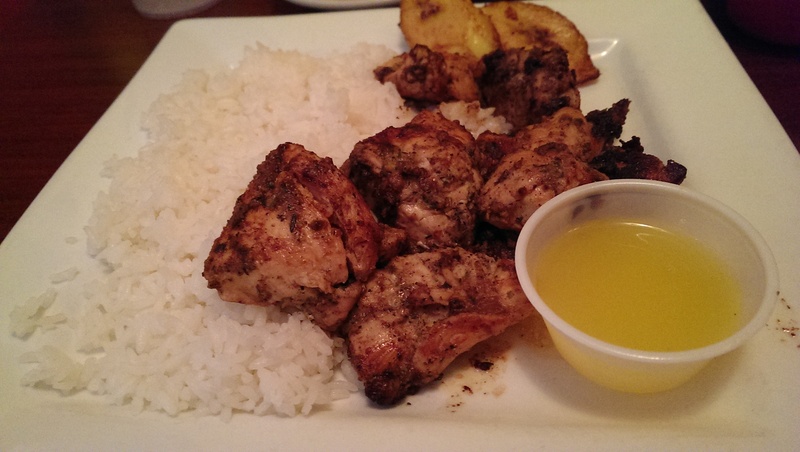 Jamaican jerk chicken with passion fruit dipping sauce and white rice. We had the sopapillas for dessert, but they weren’t anything to brag about. Kind of bland, dry and hard. Even the honey was questionable. When Jon turned the bear-shaped plastic bottle over to squeeze the honey on his sopapilla, the top came off. But, weirdly, the honey poured out like water. It looked like they’d watered down the honey. It tasted watered down too. Not sure what was up with that, but we enjoyed our dinner and didn’t let the relatively tasteless sopapillas and watery honey bother us. Besides, we were looking forward to the rest of the evening in our home that was still empty and quiet…..and that meant opening a bottle of pinot noir and catching an episode or two of “Mad Men” on Netflix.